It's a Giant DIY Checkers Set! Yep, and not just any old Giant DIY Checkers Set, friends! We made ours Snowman themed! One of my favorite things about this DIY Holiday Gift (aside from the fact that it's ADORABLE?!) 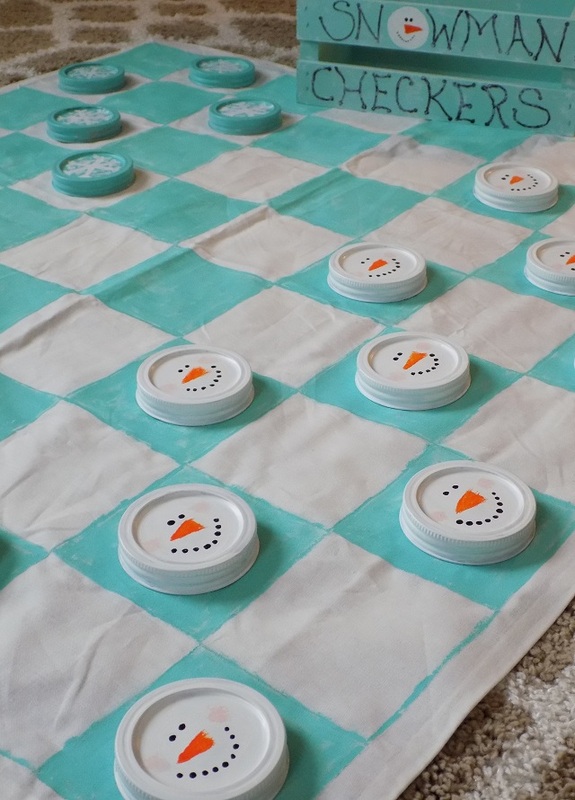 The total cost to assemble each Giant DIY Snowman Checkers, rang in at under $10! My older daughter and I have been up to our elbows in craft supplies over the past two weeks. We've been brainstorming new DIY's daily, to make good use of our craft scraps for the upcoming holiday craft fair. In addition to making a few sets for the craft fair, we also made 2 sets to gift to close friends who have young children, as a "family gift." Each set only requires 2 boxes of mason jar lids / canning lids, and a few other simple supplies. If you've been reading here for a while, you may remember our original XL Checker Set made with Mason Jar Lids; my older kids STILL play with that set! It's definitely a family favorite, and it's super portable/durable. 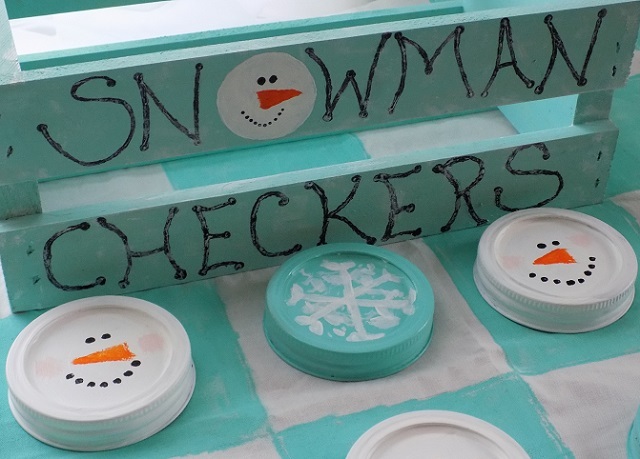 Read on for the full supply list and our simple tutorial, to make your own Giant DIY Snowman Checkers Set this Holiday season! Optional: a wooden crate or canvas bag to store your Giant Snowman Checkers Set. Start by creating a template for your checker board squares. We made our squares 3". Your fabric checker board will have a total of 64 squares. 8 rows of 8 squares. 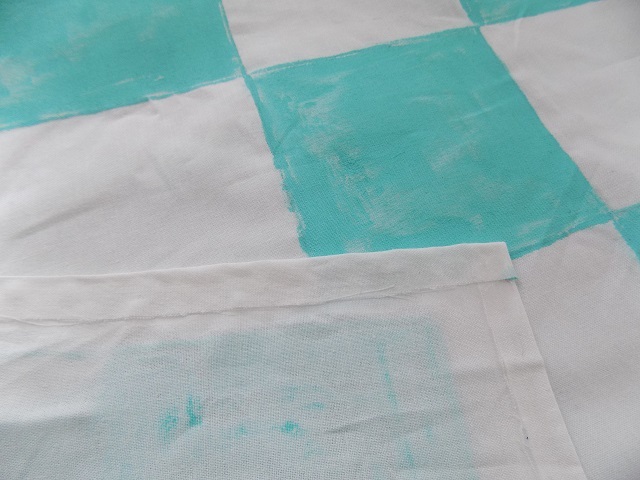 Use your template and trace (with a pencil) to frame out your checker board on your fabric. Next, on a protected surface, use a sponge brush and fabric paint, to paint every other square on your checker board (refer to imagery above and below. Tip: make sure to NOT saturate your sponge brush or the paint will bleed through the fabric to the surface underneath. Set to the side and allow adequate time for trying. Once dry, trim excess fabric down, and finish off the edges of your fabric checker board by creating a simple hem using liquid stitch adhesive. Set to the side and allow adequate time for drying. To make your giant checkers, start by gluing the canning lid / mason jar lid centers inside the rings (using a few dabs of Krazy Glue.) Allow adequate time for drying. 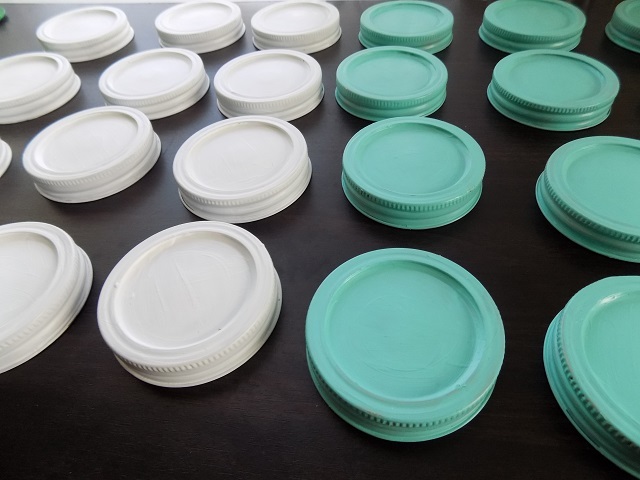 Now, using multi-surface paint and a paintbrush, paint 12 of your canning lid/mason jar lid checkers teal, and 12 of your canning lid/mason jar lid checkers white. 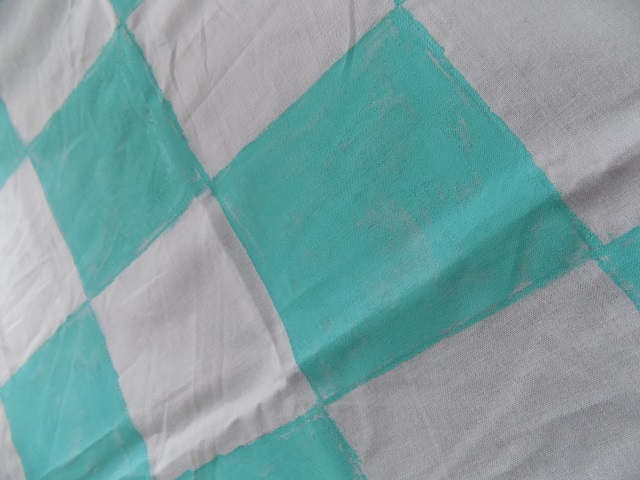 Set to the side and allow adequate time for drying (note: checkers may require two coats of paint. Once base coats of paint have dried completely, it's time to add the details! 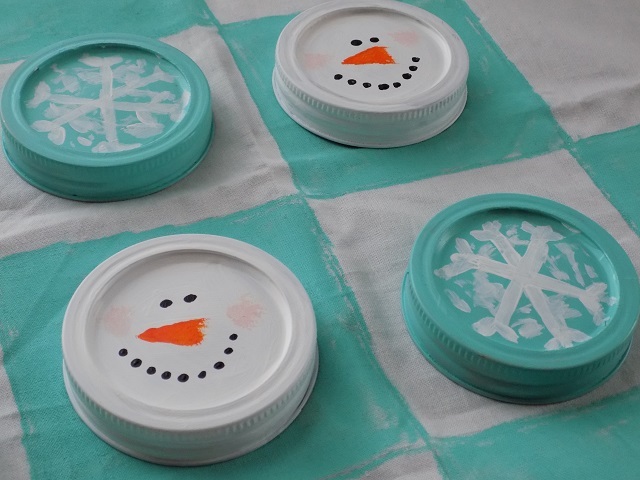 Using multi-surface paint and a paintbrush, paint a snowman face on each white checker, and a snowflake on each teal checker. Set to the side and allow adequate time for drying. Optional: paint a simple wooden crate to store/gift your Giant DIY Snowman Checker Set, or store it in a canvas bag. 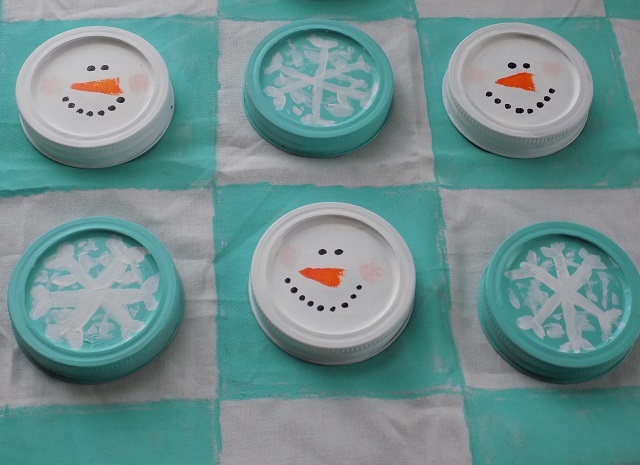 Enjoy your completed Giant DIY Snowman Checkers Set, or gift to someone special! This is the cutest gift that I've seen all day! Such a great idea! It is a really neat idea. I never thought of using mason jar lids like that. This is adorable, and could be hours and hours of fun! This is so cute and such a fun idea. Brilliant, fits the budget too!